At this point, the official response to the nurses strike has very little to do with the merits of the case. Hey, if the coalition government yields anything further to the nurses’ demands, it has concluded, what signal would that send to the teachers in their pay round? Yet if we’re really looking at the big picture, the claims by nurses, midwives and healthcare assistants are part of a wider struggle. In September last year. the newly appointed director general of the World Health Organisation spoke out against the tendency of so many governments to regard the health sector as a cost to be contained. Moral conviction though, seems to be in pretty short supply. On the eve of the first nurses’ strike in almost 30 years, the women and men on the picket lines tomorrow will be looking for those in power to treat the crisis in their profession as an opportunity to invest in public health, rather than as a threat to be managed. Fat chance. Therefore, and in a climate where inner-take-all attitudes have become the political norm, compromise can look like a mug’s game. The fact that nurses now feel impelled to go on strike to achieve fair pay grades and safe staff-to-patient ratios for themselves and their colleagues (and in order to attract others to their profession) is a reflection of just how bitter the battle for recognition has become. To state the obvious… the decision to strike has been the end product of a frustration that has been building for years on the hospital wards, and is not due to union militancy. 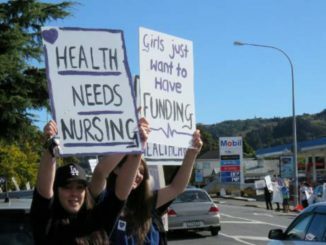 This week, a majority of the 30,000 nurses, midwives and healthcare assistants voted against the advice of the New Zealand Nurses Organisation (NZNO) to accept the deal on the table, and build on it later. Instead, most nurses have concluded that the time for a fair and lasting settlement is right now, given the difficulty of mounting a similar nationwide movement again next year, and again in the year after that. Meanwhile, opportunists are watching and waiting on the sidelines. In late May, National Party leader Simon Bridges cynically announced his support of the nurses’ plans to strike – so that he could then make political capital out of the contrast between these kind of strike actions and the “stable environment” on industrial matters that prevailed during National’s nine years in office. It was always a phony peace. Over that whole period of so-called “stability”, the majority of nurses felt taken for granted. Amid claims there was no more money available for them, nurses watched the salaries of top DHB managers steadily increase, while the promises of action on staffing ratios and pay equity melted away. Inexorably, the wages and staffing conditions for nurses, midwives and healthcare assistants in the public health system fell further behind what’s available in Australia and elsewhere. Overall, the pressure on fewer nurses to do more in return for relatively less, increased. The result has been a legacy of resentment in a profession formerly synonymous with the notion of selfless public service. There is nothing in this situation for Simon Bridges to feel proud about. The familiar line taken by the current government – that no more money is available beyond last week’s DHB package – has gone down badly in a week when the government books are reportedly in relatively healthy shape. Also, sufficient fiscal headroom has been found to allocate at least $NZ2.3 billion by 2025 to purchase and operate four new maritime surveillance and anti-submarine aircraft for the military. This figure is well in excess of the $520 million estimated cost of the nurses pay claim by mid 2020. Other big-ticket items on the Defence shopping list are waiting to be announced later this year. As this column has been arguing since early 2016, there is no way this massive Defence spend-up won’t crowd out the money that’s available to meet social needs. The government’s decision to hold the line on the nurses pay claim is an early example of this process. The rejigged nurses pay offer rejected this week was a complex one, including three 3% pay rises staggered over the next 18 months, an immediate $38 million injection to alleviate staff shortages, a $2000 lump sum payment and a commitment to enact pay equity by December 2019. Nurses’ base salaries would have risen by 9 to 16 percent over the next 18 months. At heart, as NZNO Industrial Services Manager Cee Payne has argued, decades of severe underfunding of public hospitals have seen the profession fail to keep pace with growing community needs, an ageing population and workforce, and increased costs. Crucially, [nurses] experience over the last ten years has been that “DHBs haven’t delivered on what they’re saying, around things like safe staffing.” After tomorrow’s strike action, the government is going to need to re-engage. And as Rage said 20 years ago, the front line is everywhere… Emergency services aside, there’s no shelter here from the pressure to fall into line.